Located near Khar station road, Le Plaisir is very welcoming and the service is great. When you enter, you see their huge kitchen where they prepare their amazing European and Italian dishes. The seating is very comforting on the 1st floor and the ambience is amazing. 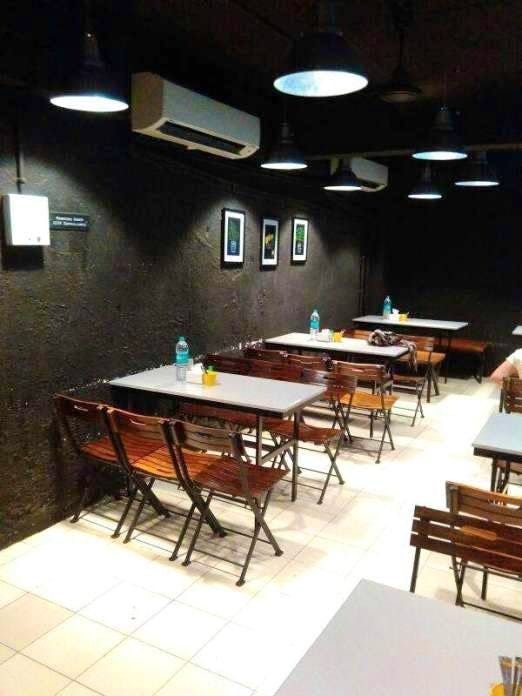 What started off as a small patisserie on Bhandarkar road a few years ago, moved on to a new location with a bigger space on Prabhat Road. It can seat about 50 people, with two sections inside. The interiors are simply done in warm brown tones with the signature patisserie counter as you walk in. It has a very high ceiling which means that there are no unnecessary food smells around. The menu is chalked up on blackboards behind the counter. One wall has the press mentions and reviews Le Plaisir and Chef Siddharth have received so far. Another one has a multitude of neatly arranged post-it notes expressing patrons’ love for Le Plaisir The major sections on the menu are – Sandwiches, Salads, Mains (Pastas & Crepes) and Desserts/Beverages. Prices listed next to all items are all inclusive so you already know how much you’re spending. Here are some of my favourites: Herbed Garlic Bread with Cheese – It simply looks like a loaf of bread with some melted cheese on the top it. But, have a bite and you will realise that the loaf is partially cut into slices and there is a generous amount of butter in between. A pleasant surprise! Meat Loader Sandwich – fully loaded with chicken and ham. The sauces, mayo, the meat everything was just so rightly cooked, flavours blending with such smoothness that makes you wonder if you’re in heaven, where it's just you and your food! Lemon butter garlic pasta- light on flavours but a great combination! The Roast Chicken and Iceberg Salad with kaffir lime dressing. Hazelnut Cheesecake –With its melt-in-your-mouth crust and deliciously creamy filling, topped with chocolate sauce and a smattering of crushed hazelnuts, what more do you want! Espresso Pannacotta is worth a taste too – wobbly and creamy. The bitterness of the coffee is balanced well with the sweetness of the caramel. Its the perfect way to finish off a meal! Dark Chocolate Orange Mousse – For the diehard dark chocolate lovers, this is nothing but pure bliss! With every bite, this just seems to get better!